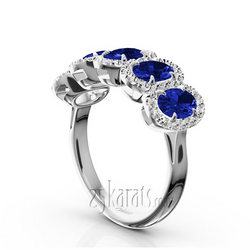 Blue Ceylon sapphires are set with eagle claw prongs and framed with micro pave set brilliant round diamonds. This anniversary band is a true statement piece! This charming ring features 5-6x4 oval sapphires and 0.45 ct. tw. brilliant diamonds. 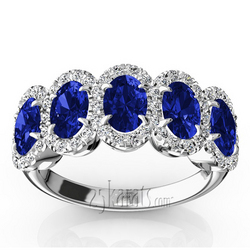 This sapphire diamond ring is available in 14k gold, 18k gold, platinum and palladium. 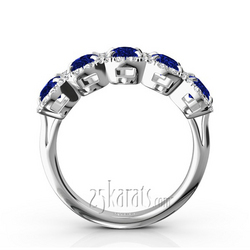 Carat Weight / Size (each): 0.008 ct. / 1.12 mm.